Chris Mears challenged me to the Railfan Five this evening. As I mentioned in my reply to his post, I don’t regard myself as much of a railfan (who has time to wait for trains? ), and so, I don’t have all that many railfan photos. However, here are some that I like, in no particular order. Being that I am not much of a railfan, the photos are important not because they are particularly good, but because of the friends that I shared the trips with. 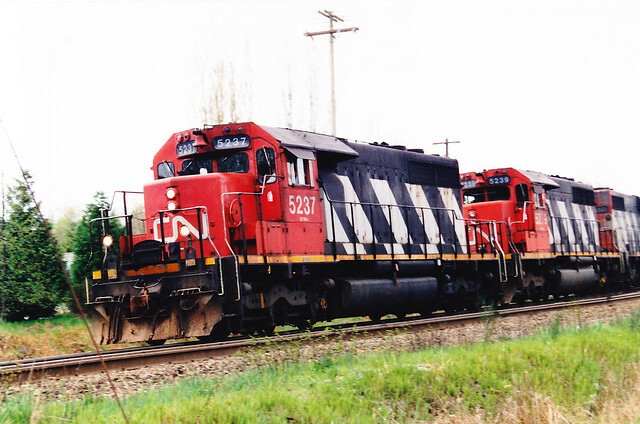 I don’t recall taking the first photo, but as I mentioned CN diesels a few days ago, and I found this one in my Flickr stream, I thought I would share it. It is probably the only true railfan photo in the lot, as I was indeed standing by some random piece of line, waiting for trains. 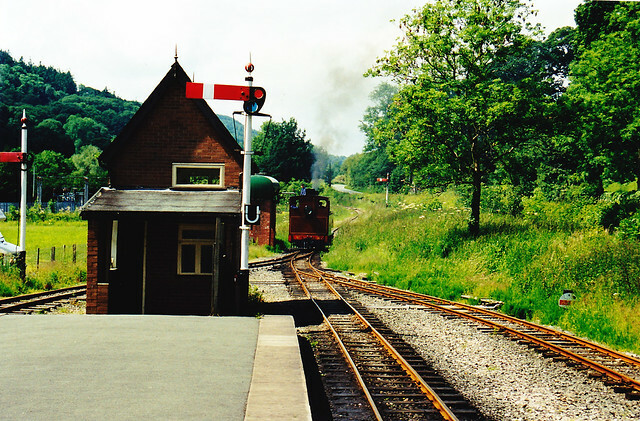 The second photo is one that I took on a trip to Wales with my good friends, Bill Scobie and David Steer. David was on a mission to see the Beyer Garratts, but we hit just about all of the two-footers. I don’t recall which of them this is, but I like the narrow gauge feel of this photo. 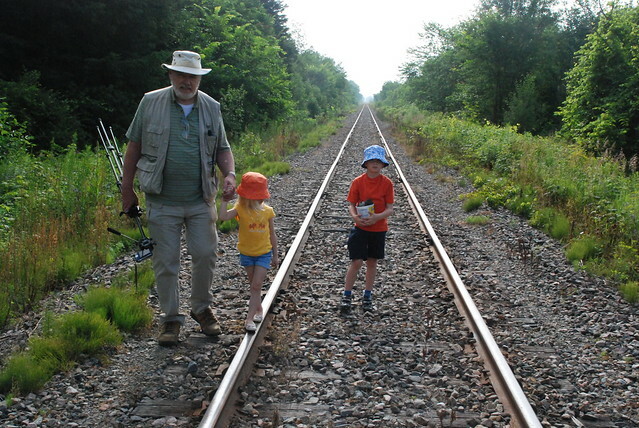 Two summers ago, the kids, my Dad and I went up to Galetta to see if we could find the Canada Atlantic ballast pit. We believe we did find it, along with a wild turkey (my first) and lots of rocks. The boy collected some rocks that he liked, and as none of the adults would carry them back for him, he carried them himself. There’ve been no trains here for years, and so, all we saw was tracks, but it is a cherished memory, and deserves a spot here. Another trip with friends is the event of the fourth photo. Mary and Neil, who we met when we lived in Henley on Thames, travelled with my wife and me down to the sites in Devon. On the way back we stopped at a preserved railway, and again, I confess I don’t recall which. I’ve always liked this photo for the evocative mood. 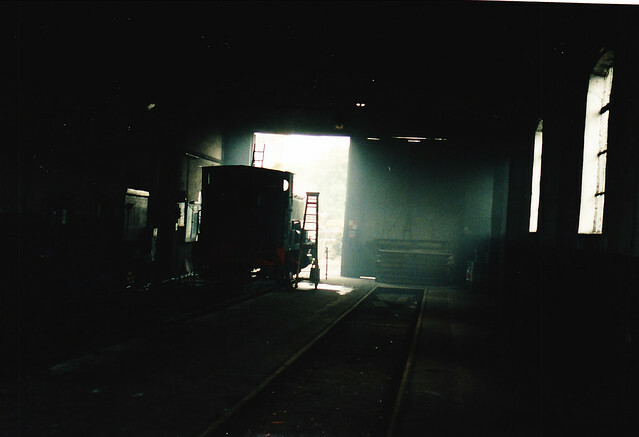 That engine was just simmering away in the shed; coal smoke, oil and steam hung in the air, playing in the light. 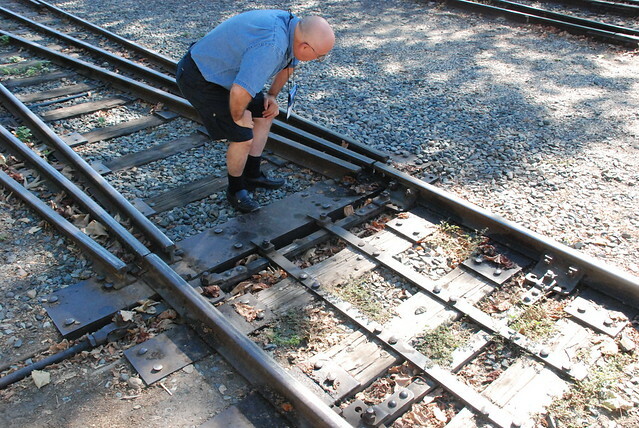 Lastly, here is Ed McCamey inspecting a three-way stub switch at the California State Railway Msuseum. Ed is the Standards and Conformance chair for the NMRA, and really the man who is responsible for the NMRA’s proto:scale standards, including Proto:87. He and I have shared a room at a number of conventions, and I hope his health improves so I see him at some future gatherings of Proto:87 folks. We’ve had plenty of laughs over the past twenty (yes, Ed, twenty!) years, and while the photo is not much of a keeper, the memories and the friendship truly are. Thanks for sharing these. I really appreciate it. No one is ever going to believe your claims that you’re not a railfan when you go posting photos like this. I think you’re done a superb job of illustrating just exactly what the Challenge is all about. Previous Previous post: Why Pembroke?